As someone who travels by plane at least eight times a year, I consume a lot of airplane food. Of the variety plane food I've eaten over the years, Chinese airplane food has been probably on average the worst. Well, according to Chinese social networking site Weibo, I'm not the only one who feels this way. Trending on Sina Weibo is the hashtag #RidiculeAirPlaneFood (#吐槽飞机餐#). Netizens have taken up the call and posted various images of plane food that they've taken in over the years. Some folks have posted some pretty appetising meals from various airlines such as Japan Airlines and Singapore Airlines. It's safe to say that despite the hashtag, these meals didn't receive much ire. The true ridicule comes at the little boxes of food provided by China's own domestic airlines, Air China (not to be confused with China Airlines from Taiwan). 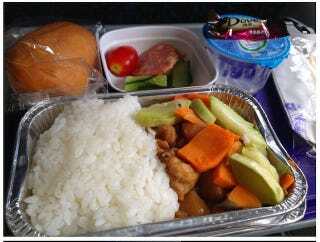 Here's what an Air China international meal looked like in 2010. Looks okay, not too bad. Here's what a domestic meal looked like. Here's an international meal for 2012. And here's the domestic version. Apple chips sure are delicious, no? Have you noticed a trend? International meals seem to be getting worse! Here is what Air China is offering for its international travelers this year. Doesn't look too bad, but let's take a look at the domestic offerings. Chinese commenters were less than amused by the food. The original poster of the images writes that netizens shouldn't complain too much and that they're lucky if they're even served food. I'm inclined to agree with the op, then again I usually don't complain about bad food.